It's Two For Tuesday and we are featuring Designers Saundra and Nicole. Every Tuesday we will have a Diva Dual where 2 of our designers will collaborate and make a project using the same chosen stamp image or dies. the Party Dies and Say It Big Stamps. Hi Everyone! 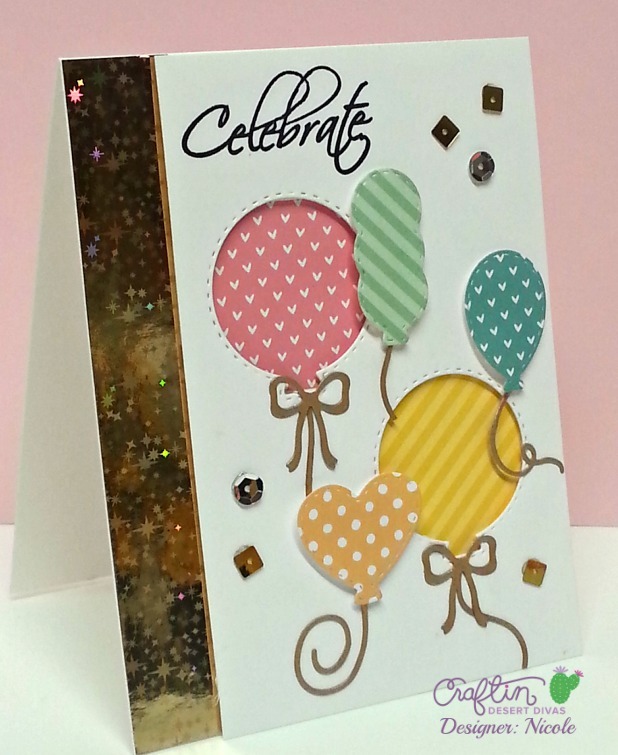 Saundra here to share a fun card using the CDD Party Dies. I was in need of another birthday card and this one is for a male friend so I took the opportunity to create a more masculine card. I used all solid colored cardstock and die cut a bunch of balloons and presents to create a top and bottom border for my card. The sentiment is from CDD Say It Big Stamps. I stamped it in the center and then added some CDD sequins that I pick out from various mixes. After all, a birthday card needs to have sequins!! After my card was created I asked my husband if he thought it would work for a man's birthday card and he gave the stamp of approval! Hello and Happy Tuesday!! Nicole here today and I am sharing my take on the "two for Tuesday" with Saundra using the Party Dies. 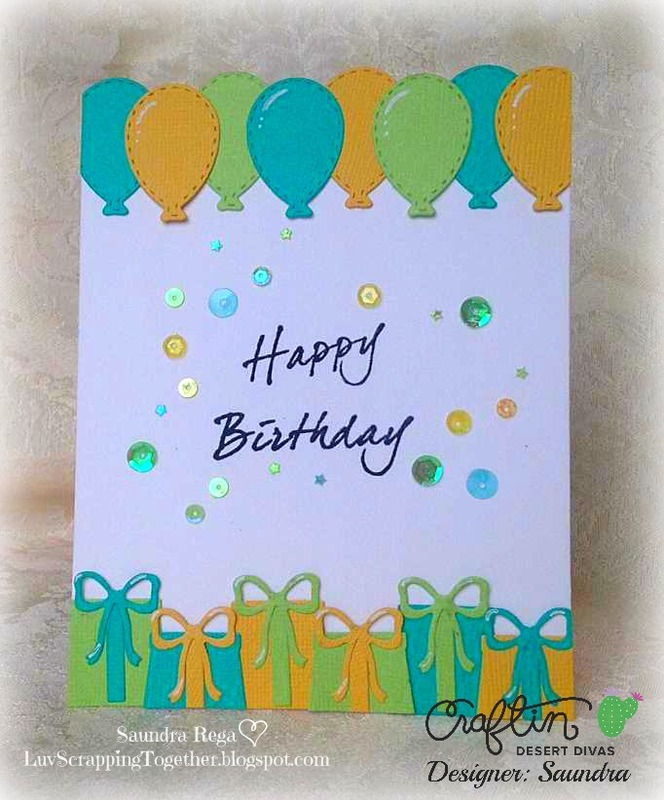 I used the larger balloon to create a negative space for the top layer of my card. I then die cut several of the other smaller balloons in a variety of patterned paper and popped them up with foam tape. I cut my card front 3/4" narrower than my base. On my base I adhered a small strip of gold hologram paper to the edge. I mounted my card layer onto my card base with foam tape. 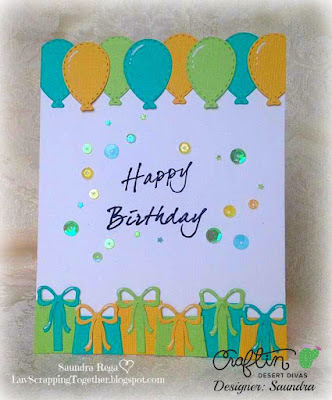 I also used the balloon string die and the bow die to finish off my balloons. My sentiment is from the Say It Big stamp set and is stamped in black ink. I added a handful of sequins from the Silver & Gold Sequin set to finish off my card. Here are the CDD products used and you can find them all in the Craftin Desert Divas Shop. Be sure to visit each designer's blog for more details about their projects. Have a great day!! Awesome cards showcasing the fun Party Dies and Say it Big stamps...cute designs by both Saundra and Nicole! Two for Tuesday sounds awesome~look forward to next week!